Wedding trends – You want your wedding to be unique and creative with a stunning effect to it? Here are some of the most popular trends this year. World-renowned designers have finally found a solution to make you feel free and unimpeded at the day of your wedding, enabling you to dance and have fun all night long. They have designed a dress that is comprised of two parts – appropriate for the formal part of the ceremony, which later transforms into an ideal dress for endless fun after the festive dinner. Although white remains to be the number one choice for wedding dresses, new collections of many designers have colours and patterns. Floral patterns are especially present this year. If you are expecting a large number of guests, take the defined dress code into consideration. For the bridesmaids it can even be white if you decided for a patterned wedding dress. Bronze, copper and gold are a total hit in room decoration this year. You can incorporate them in your cutlery, vases, candleholders and other decorative items. Metal décors will blend in beautifully within any style, whether it is rustic, modern or glamorous. Mix silver, bronze and gold hues to add more aesthetic value and elegance to the space. You want your wedding to be unique and creative with a stunning effect to it? Here are some of the most popular trends this year. The palette of colours present in this year’s wedding designs is a combination of two nuances – blushy red and gentle pastel blue. You will surely see much of these colours. I advise matching these tones to white, grey, silver or golden tones. Wedding bouquets in classic Biedermeier style has become completely out-of-date. Excessive symmetry has been seen to many times. A much more casual style with an abundance of various greenery has finally made its return. A special trend this year are seemingly unconventional plants, such as cultivated carrot. If your wedding venue has high ceilings, you can use the empty vertical space to introduce decorative items such as pompoms, lanterns, flags, lights, flower decorations and so much more. Additional lighting will enliven the space and the decorative elements will make the space fresher and more colourful. Adjust your menus to the local offer of ingredients. By adding seasonal items, you will achieve sensational flavours. 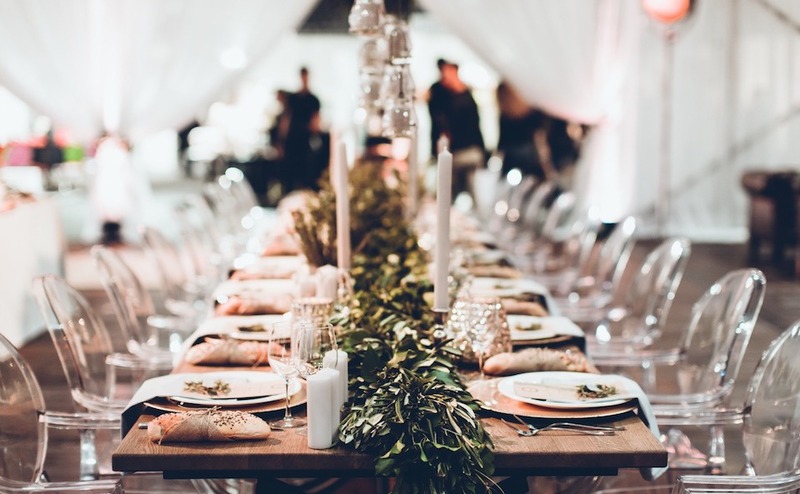 Smaller portions of food in several courses are the key of keeping the energy during the night high, and a creative menu that steps out of the ordinary shall additionally intrigue your guests. After years and years of wedding cakes and various desserts being served directly to the guests’ tables, serving them on separate dessert tables has become increasingly popular. Blend sweet delicacies into the space by adding colourful textiles, adding a couple of candles and decorative vases. That way, your guests can enjoy the desserts all night long, and the space will be get an additional scenographic element. Flowers for Mother’s Day in Croatia. Did you know that Anna Marie Jarvis is regarded as the “founder” of Mother’s Day in 1907, which was marked by distributing 500 white carnations to all mothers on Mothers Day Meetings in which they gathered to discuss current issues. Although white carnations have been long forgotten, giving flowers has become a tradition and a wonderful gesture which celebrates Mother’s Day. This year, Mother’s Day is on May 8th, and is always celebrated on the second Sunday of May. Give a bouquet of fragrant seasonal flowers to tell your mother you love her. Flowers for Mother’s Day in Croatia. Classic fragrant roses in a box, a vase or just one fragrant little flower in a vase which will remain as a permanent reminder of your feelings and put a smile on any mother’s face. Take a peek into our online flower shop and select the ideal gift. If you desire something completely different and special, call or even visit our location and participate in the creation of a perfect floral decoration. When you come to our studio, you will have the opportunity to choose your own gift or at least write a personal little message for your beloved mom. Did you know that Anna Marie Jarvis is regarded as the “founder” of Mother’s Day in 1907, which was marked by distributing 500 white carnations to all mothers on Mothers Day Meetings in which they gathered to discuss current issues. Although white carnations have been long forgotten, giving flowers has become a tradition and a wonderful gesture which celebrates Mother’s Day. This year, Mother’s Day is on May 8th, and is always celebrated on the second Sunday of May. Classic fragrant roses in a box, a vase or just one fragrant little flower in a vase which will remain as a permanent reminder of your feelings and put a smile on any mother’s face. Flowers webshop and delivery of flowers in Croatia. received a beautiful bouquet of flowers as a gift, you’ve put it in a vase and now you are enjoying just watching it. Do you ever wonder how it was made, who made it and how much time and effort has gone into its making? This short story will introduce you to the process of making bouquets, starting from the very purchase of flowers to the final packaging process. Our day begins with a visit to a wholesale flower supplier because I want to personally inspect the ordered flowers and choose new sorts. The emphasis is put on the flower sorts of the highest quality and freshness, where my experience and excellent cooperation with the suppliers and growers come in handy. Flowers webshop and delivery of flowers in Croatia. After the morning adventure, flowers are delivered to the workshop, where each flower and stem passes through the expert hands of my florists. Flowers are cleaned from extra leaves and thorns are removed from the roses. A cut 2 cm long is incised into the stem so that it can absorb water more easily. The water must be cold and clean so that the flowers would last as long as possible. It is not advisable to add sugar or aspirin because they close stem pores and that way flowers wilt quicker. YOU RECEIVED A BEAUTIFUL BOUQUET OF FLOWERS AS A GIFT, YOU’VE PUT IT IN A VASE AND NOW YOU ARE ENJOYING JUST WATCHING IT. After the morning adventure, flowers are delivered to the workshop, where each flower and stem passes through the expert hands of my florists. Flowers are cleaned from extra leaves and thorns are removed from the roses. A cut 2 cm long is incised into the stem so that it can absorb water more easily. The water must be cold and clean so that the flowers would last as long as possible. It is not advisable to add sugar or aspirin because they close stem pores and that way flowers wilt quicker. Flowers are additionally keep in refrigerators in order to keep them fresh and the flowers closed. From the moment of picking them up on the market, all the way to their last use, it is best for the flowers to reside in specialized refrigerators and at certain temperatures to slow down the aging process and allow the end user to enjoy their scent, freshness and beauty for as long as possible. Next in line is the paperwork – sometimes it lasts for a couple of hours. We need to count all flowers and plants, write the numbers down, determine the codes, set the prices and so on, but we will not continue talking about that because we prefer flowers, creativity and making decorations. So, to conclude, when making bouquets design, composition, colour and mathematics are all equally important. How is a bouquet made? By harmonizing flower types in regard to their forms, colours and durability, considering the given theme or occasion and making sure the process stays within the budget. The style and the method of composing the bouquet depends on the occasion, sorts of flowers, customer’s request, as well as on the current inspiration of the florist. HOWEVER, THERE ARE TECHNICAL RULES THAT EVERY FLORIST MUST HOLD ON TO. THE TECHNICAL SIDE OF CREATING BOUQUETS AND ARRANGEMENTS IS LEARNED FOR YEARS, AND THE EXPERIENCE OF WORKING WITH FLOWERS IS VERY IMPORTANT. HOWEVER, MY OPINION IS THAT WHAT CARRIES THE MOST IMPORTANCE IS OUR LOVE FOR FLOWERS! Once finished, a bouquet is wrapped, or as I like to put it, tucked in abundantly in fine silk paper and decorated with grosgrain ribbon or a glorious bow. Flower arrangements and installations in vases are placed in Lela Design boxes, custom-made based on our design and are again lavishly tucked in fine silk paper and decorated with grosgrain ribbon. Floral decorations in boxes were designed for situations when the recipient does not have a vase available at the moment of receiving the flowers. A water-soaked sponge is put into a box measuring 12x12x12 cm in order to keep freshness for a long time. I shall reveal a small secret to you – flowers treated this way last longer than a bouquet because the stems are shorter and the flowers can soak water better and more easily. Our product – flowers in a box – come in white Lela Design boxes measuring 63x16x10 cm. They are also wrapped in fine silk paper and decorated with grosgrain ribbon. This product is meant for persons who desire to do their own arrangements. If you wish, we can send a personalized note along with the chosen bouquet or decoration with the delivery. And finally, a smile for our client is the final touch, with which we hand them our handwork , made with lots of attention and love.